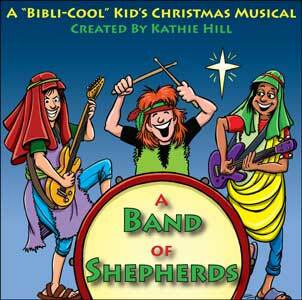 A Band of Shepherds Christmas : Kathie Hill Music, LLC, Making music with and for kids for over 25 years! Originally released as a youth musical, we’ve re-voiced A Band of Shepherds in unision/2 part to rock the nativity story for kids! When taxpayers at the Bethlehem census get rowdy, “The Dead Shepherds” are brought in to entertain them. As Christmas Eve progresses these hopeless head-bangers audition Joyce, a new singer who tells of the promised Messiah. They are then visited by rapping angels, meet the Christ Child and are transformed musically and spiritually to share the news with others. Note: Performance DVD is duplicated from original youth choir VHS, but gives great ideas for costumes, choreography and blocking. Kathie's Note: This is the perfect musical to engage older kids who’ll love the characters & choreography demonstrated by teens on the original Performance DVD. Incorporate younger kids as angels in Scenes 2 & 3 and/or use teens as adult characters to add more “street creds” to your presentation. Kids and adults will love this homage to ‘80s music and thoughtful retelling of the Luke 2 Christmas story! Split track CD contains the orchestral accompaniment in a split-track version with choral vocals on one channel and instruments on the other. As this CD is used for performance, no solos or dialogue is included. .
Downloadable PDF contains 4 Lessons Plans for each song plus scripture memory verses. Downloadable PDF of all songs (leadline & chords), script and production notes with permission to make 5 copies . Additional copies require purchase of additional 5x license/s.